Watch the News-spot on VISIR-television, 11 Januar 2010. The Republic of Iceland was formally inaugurated at 0200.pm, on 17 June 1944 after the Union with Denmark had been terminated by a general election. -ref. The Book of World Horoscopes - Nicholas Campion. National crises peaks in early 2010. A Solution during Summer. 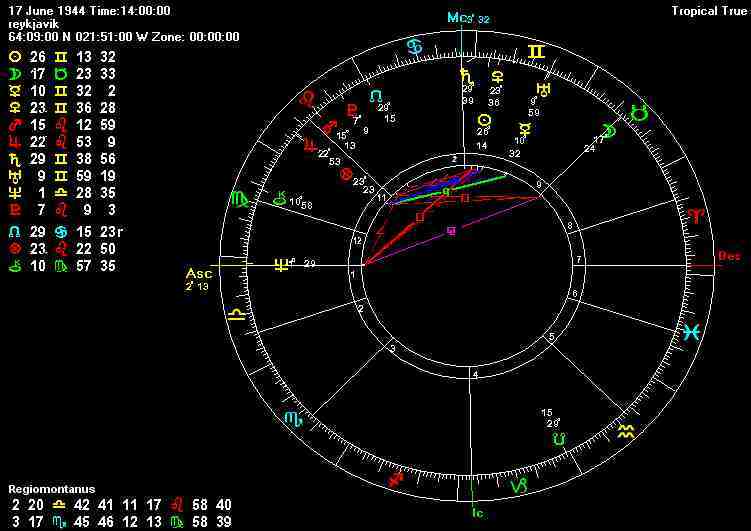 Transit Pluto has been building up pressure toward the national chart of Iceland since 2008 and through 2010 this planet will be passing in the North of the national chart. At the same time as Saturn it crossing the ascendant in the East and the months of February and March are due to be particularly critical. But looking ahead, transit Jupiter will reach the the 7th house during the months of Summer. After everything has come crashing down a powerful alliance is likely to appear on the scene and pave the way for the Icelandic future. The coming months are likely to be very difficult with much disagreement and unhappiness. The government will have problems in surviving he crises. It can be acheived, but not without difficulty. Protests and frustration seem almost inevitable - but Iceland are in a difficult situation, they are bankrupt and need to work to find a solution. 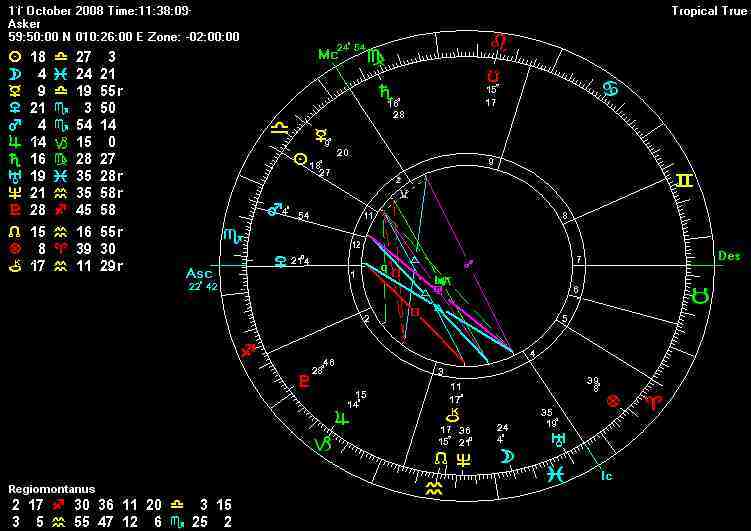 At the moment, however, Saturn and Pluto are crashing down on the nation that feels very much isolated. It's like a tower tumbling to the ground and nobody wants to help out or try to soften the fall. Astrology has something to offer here - because it provides a picture/road map of what is going on and how long things will take. That sometimes makes the struggle easier to bear. In the Summer of 2010, from June to August, transit Jupiter will cross the descendant of the national chart, which shows some partnership, marriage or agreement. There is likely to appear a partner at this point and offer some financial solution and alliance. There may still be some question of Icelandic sovreignity - but maybe the arrangement arrived upon is something thought of as a temporary solution. I think there might be some turmoil at Saturn retrogrades back into Virgo fram April through to June, but then things move forward again and particularly from the middle of September when Pluto turns direct, the work will begin to sort out the rubble, with progress and a more decisive plan and effort to get things back into order. Links: Skyscript.co.uk: National chart of Iceland, Will there be a new union?